to-morrow the ‘headlines’ will change as we move on. But what is not in the ‘head-lines’ is what is happening on the ground, the ‘process’. South Africans are fighting back, on the streets, in their political parties, in their unions, in their NGO’s, in their business institutions! But………….sadly, ‘processes’ don’t make the ‘headlines’. The Intelligence Bulletin www.theintelligencebulletin.co.za published a well-researched document on this ‘fight-back’. “There is a good South African story to tell, but it is not the ANC’s. It, in fact, comes despite the ANC and what it became to represent since Pholokwane 2007. While the present dominant South African narrative is one of doom and gloom – of a country in the grips of state capture, of failing service delivery, failing state enterprises, an economy in recession, rising unemployment, tense race relations, and above all, of a head of state with a string of corruption charges hanging of his head with a highly destructive factional battle to succeed him raging within the governing party. That, however, is only one side of the SA story. 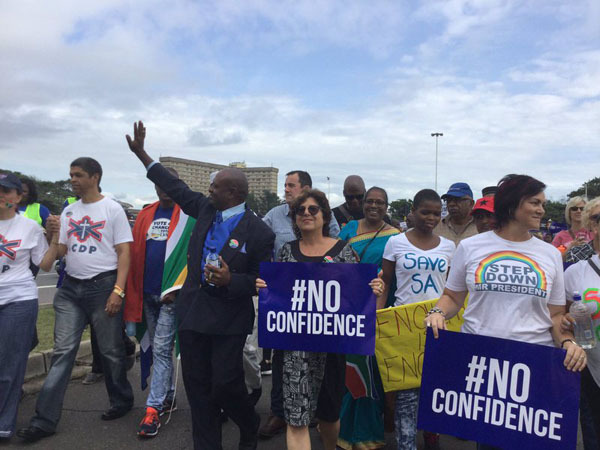 There is also the story of a civil society joining hands, across many dividing lines, to fight state capture and the corruption that comes with it – and starting to win the battle hands down, while shaming international players for their vigilance neglect, and/or complicity. It is the story of increasing numbers of political, and other leaders finding their voices, speaking out against, and condemn, what has gone wrong – committing to fix it. Astonishingly 35 ANC MPs voted for a motion of no confidence in President Zuma. No ‘dyke’ with 35 leaks will hold. And, despite the efforts of the benefactors of state capture, with the help or hired hands from outside, there are signs that on the ground relations between population groups are indeed improving. A recent Institute of Race Relations survey found that relations on the ground amongst ordinary South Africans are a lot more solid than generally perceived. One of the most positive stories of the last ten days or so, proving that South African civil society is winning the battle against state capture, was the news that India’s Bank of Baroda has started the process of closing the bank accounts of the state capturing Gupta family. Thanks to the South African constitution, guaranteeing its freedom and independence, the country’s media has done a sterling job, only exposing the tentacles of state capture and is accompanying corruption, but ensuring that the ‘charge sheet’ is updated on almost a daily basis – especially Scorpio & amaBhungane doing an excellent job with the basic spadework. International audit firm KMPG has been fired by Sygni’s Wierzycka for not doing their job properly in the Gupta saga, and McKinsey & Company is reviewing thousands of documents related to interactions with Gupta-tainted Trillian Capital Partners. Vitol Group, the world’s largest independent oil trader, abandoned a deal to buy a stake in the Richards Bay Coal Terminal from a company controlled by the Gupta family; and the list goes on, with more revelations still likely to come to light. The international implications in the slipstream of the fightback can also be expected to broaden. Not only has DA leader Mmusi Maimane raised the matter with the United Arab Emirates, where there is a prominent Zupta footprint, but the fact that the US Dollar was the denomination of so many of the suspect international transaction, is likely to bring American authorities into play soon. For South Africa, there are also broader positives from the drama. For one, South Africans can be proud of how it is setting an international example of how to stage a fightback against corruption. Small wonder that the country’s brand was just ranked 45th out of 71 countries in the Country RepTrak® study conducted by Reputation House – two positions ahead of the United States. 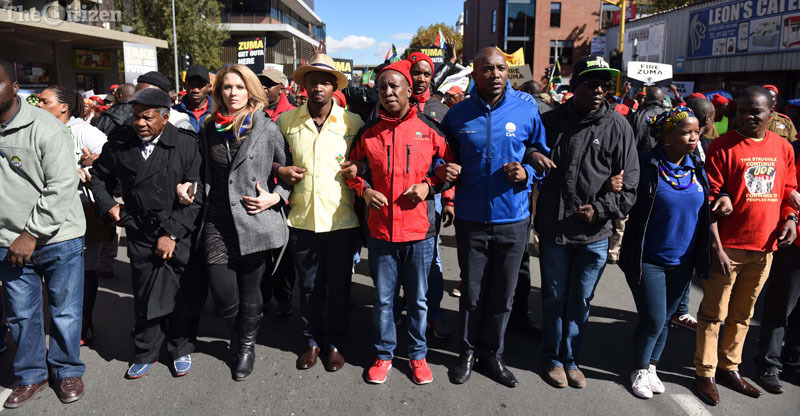 The experience is uniting South Africans from across the full societal spectrum – from political parties, NGOs, religious bodies, and civil society at large, across racial divides. This bodes well for the possibility for successful coalition government after the 2019 general elections. 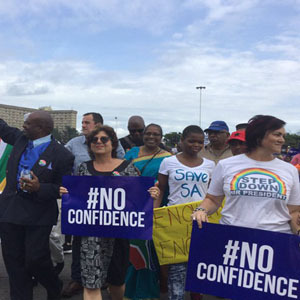 The outcome of the parliamentary ‘No Confidence’ Vote in President Zuma is significant with a range of possibilities going forward, all of which have to do with succession. As Peter Bruce says, “That vote will come down to three people — Nkosazana Dlamini-Zuma, Cyril Ramaphosa and Zweli Mkhize”. The ‘battle’ is going to be ugly, the ‘war’ has to be the 2019 outcome. South Africans are not going to allow this battle to be won by Zuma, we, of all political persuasions, have had enough. Maimane has already raised the possibility of an early election in its wake, if the vote should go against the president. South Africans are also putting more developed countries to shame and setting an example of how to deal with, and persist, with action when the Bell Pottingers of this world oversteps the lines of propriety. 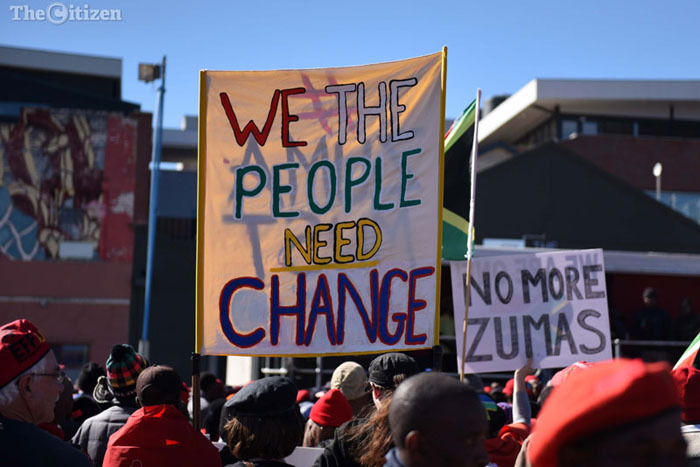 The battle to reclaim what is right might not be over yet, a long, hard, and challenging road of rebuilding still lies, but once it is over, South Africans will have much to be proud of, looking back and fighting back.